The 42 letter Name of god is composed from a sequence of seven letters that are corresponded to the seven days of the week. Each sequence from the 7 releases its own unique spiritual force. This force can be used to transform your life and world. One of God’s many names mentioned in the book of Zohar and in the writings of Rabbi Moses ben jacob Cordovero (In Hebrew: רבי משה בן יעקב קורדובירו) and Rabbi Abraham ben Samuel Abulafia (In Hebrew: רבי אברהם בן שמואל אבולעפיה) is the 42 letters name of god. In the book of Zohar, the 72 names of God and the 42 letter name of God are discussed together. The sources are divided to the origin of the 42 letter name of God. Some of the sources say it’s the acronym from a prayer called ‘Ana beKoah’ (In Hebrew: אנא בכוח) – The prayer is called by that name after the first two words of the prayer which means “Please in your power”. 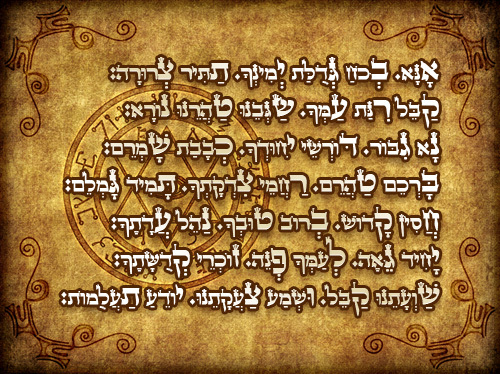 This prayer is attributed to Rabbi Nehunya Ben Hakana (In Hebrew: רבי נחוניה בן הקנה) Others sources say that the name is the result of a permutation the first 42 letters of Genesis, and that the prayer that was written by Rabbi Nehunya Ben Hakana so it’s acronym would be the 42 letter name of God.